City mourns the death of renowned littérateur Sardar Kartar Singh Duggal. 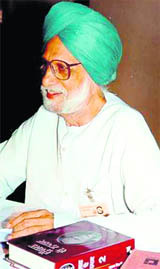 The master craftsman of Punjabi literature penned several short stories, plays and poems apart from his work as a critic. He was known for his work about the volatile period of Punjab, whether it was the freedom struggle or the declaration of Emergency. He has been credited for promotion of arts through opening of Virsa Vihars throughout Punjab while he was serving as a member of Rajya Sabha. “Sardar Kartar Singh Duggal was a great personality who paved the way for promotion of cultural activities in Amritsar and other areas of Punjab. As MP, he came up with Virsa Vihar concept, a centre of cultural hub for artistes, and gave funds to maintain them,” said Kewal Dhaliwal, director, Virsa Vihar, Amritsar. The writer donated Rs 2 crore to each Virsa Vihar in Amritsar, Jalandhar and Kapurthala, he said. “Political leaders have not done so much for art and culture as this man did,” he added. The writer was to be honoured with a Honoris Causa degree by Guru Nanak Dev University (GNDU) at its 38th annual convocation on February 1. “The news came as a shock to us. He was not keeping well for a past few days, yet he was to be conferred with the degree this year. He was a man of cause; never backed out from giving out to society. I had interacted with him on few occasions and his thought process was extraordinary,” said Inderjit Singh, Registrar of the GNDU. Neha Saini, Tribune News Service, Amritsar, January 27.